Creatinine is a waste product that forms when creatine is broken down. The kidneys are responsible for eliminating this waste product from the body, so blood creatinine levels are an important indicator of kidney function. If blood creatinine levels are too high, it can indicate a decline in kidney function. There are some steps that can improve creatinine levels and reduce the workload on the kidneys. Creatine is a substance that is found in high-protein animal products such as red meat and poultry. When creatine is broken down for energy, creatinine is produced. One way to improve blood creatinine levels is to reduce the amount of protein that is eaten in the diet. When consumption of these high-protein foods declines, there is less creatine available to break down into creatinine. Eating less protein can also reduce the amount of work the kidneys have to do to filter the blood and remove waste products from the body. While high creatinine levels can indicate a serious medical condition, dehydration can also cause an increase in serum creatinine. Increasing fluid intake can help avoid dehydration and eliminate the possibility of elevating creatinine levels. 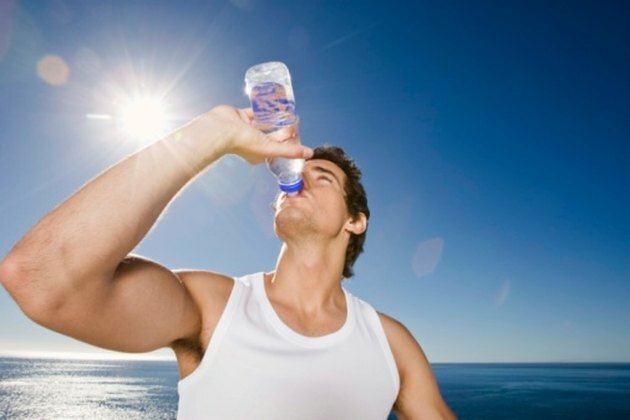 The Institute of Medicine recommends that women consume 2.2 liters of fluid and men consume 3 liters of fluid per day. While any fluid counts toward total fluid intake, water is the best choice. Drinks with caffeine and carbonation should be avoided. Some urinary tract conditions can cause elevations of creatinine in the blood. Examples include kidney infections and urinary obstructions. Getting the proper treatment for these conditions can help to restore creatinine levels to a normal range. Kidney infections may be treated with oral or intravenous antibiotics. Urinary tract obstructions may require surgical intervention. Follow all instructions on how to take prescribed medications or when to report for surgical treatment. Hypertension, or high blood pressure, is a condition that can contribute to the development of kidney disease and eventual end stage renal disease (ESRD). High blood pressure leads to kidney damage by damaging the blood vessels that supply the kidneys with fresh blood. This can trigger high creatinine levels in the blood. Eat a diet that is low in sodium and get plenty of exercise. If high blood pressure medications are prescribed, carefully follow all dosage instructions. Diabetes is another medical condition that can lead to kidney damage or kidney failure. Diabetes also damages the blood vessels in the kidneys, making it difficult for the organs to work properly. Diabetics should carefully manage their diabetes to improve high creatinine levels. This means following a diabetic diet and taking insulin and other medications as prescribed. This can help to reduce creatinine levels and also reduces the risk for kidney disease, stroke and other serious medical conditions. Mayo Clinic - Water: How Much Should You Drink Every Day? Can You Improve GFR With Diet? How Much Creatine Can Your Muscles Absorb?